Brian Robbins, a former actor and now head of the pioneering youth-oriented multi-platform media company AwesomenessTV, was one of the first stars to walk the red carpet…. Then came our New Producers to Watch – hot new talents and winners of a pre-MIPTV competition – including online lifestyle stars Mr Kate (Joshua Dawson & Kate Albrecht): they got a warm welcome from the MIPTV team! Neal Purvis and Robert Wade of the BBC’s SS-GB were up next. They also happened to write all the recent James Bond films, including Skyfall. Catherine Bell and James Denton of ITV’s The Good Witch followed close behind. Remember Denton from Desperate Housewives? Of course you do! Next were the stars of ITV/A+E’s Texas Rising, MIPTV 2015’s World Premiere Screening: stars Bill Paxton, Ray Liotta and Olivier Martinez, producer Leslie Greif and director Roland Joffe. Elizabeth Mitchell then followed, for STUDIOCANAL’s Crossing Lines – The Time is Now. Next up were William Spencer, Caine Sinclair and Daniel Cabrera for Marriott Content Global Studio’s The Two Bellmen. Just one of the innovative branded entertainment productions that has earned Marriott MIPTV’s Brand of the Year Award, to be granted tomorrow in Cannes! (Real) ex-model Rachel Hunter was fully at ease with the photographers to promote Zodiak Rights’ Rachel Hunter’s Tour of Beauty. Then Mena Suvari – of American Beauty fame – closed off proceedings, for Sonar Entertainment’s South of Hell. Magnificent! Needless to say, a fabulous time was then had by all after that! Opening Night Party highlights included the International Digital Emmy Awards, whose winners were delighted to have their digital creativity honoured! 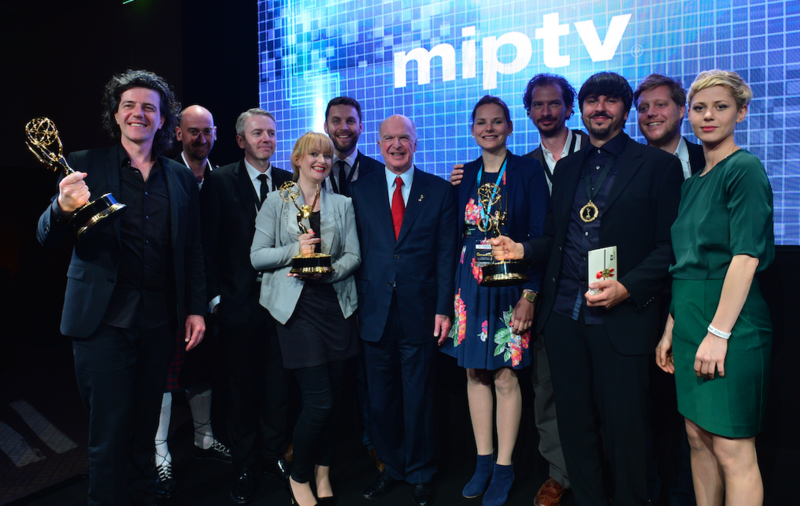 Full International Digital Emmy Awards winners details here.